This chapter foregrounds the context of young adolescent learning in schools, emphasising that engaging young adolescents is crucial to achieving optimal educational outcomes. The authors explain their contention that all young adolescent students are at risk of disengagement or underachievement. The approach taken in this book reflects current educational trends away from a deficit view of young adolescents at risk of disengaging from schooling towards a more holistic view of the factors that lead to student disengagement. 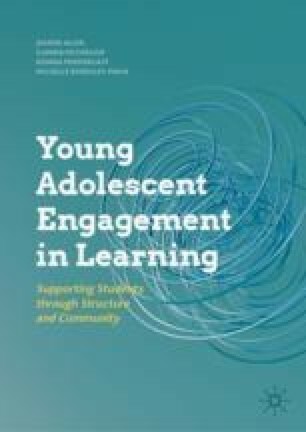 In this chapter, the authors explore the challenge of engaging young adolescents in learning, including those students with complex learning needs, who exhibit challenging or aggressive behaviour, or who have additional support needs; and interrogate the factors that may contribute to student disengagement and those that enhance engagement. Adolescent Success. (2018a). About us. https://www.adolescentsuccess.org.au/. Association for Middle Level Education (AMLE). (2018). AMLE at a glance. https://www.amle.org/AboutAMLE/AMLEataGlance/tabid/122/Default.aspx. Bauer, R. (2016). Weekly wire: The global forum. The World Bank. Retrieved from https://blogs.worldbank.org/publicsphere/weekly-wire-global-forum-271. Caskey, M., & Anfara, V. A. (2014). Developmental characteristics of young adolescents: Research summary. Westerville, OH: Association for Middle Level Education. https://www.amle.org/BrowsebyTopic/WhatsNew/WNDet/TabId/270/ArtMID/888/ArticleID/455/Developmental-Characteristics-of-Young-Adolescents.aspx. Commonwealth of Australia. (2018). Report on Government Services, 2018. Canberra, ACT: Productivity Commission, Commonwealth of Australia. https://www.pc.gov.au/research/ongoing/report-on-government-services/2018/child-care-education-and-training/school-education. Department of Education and Training. (2017). Everybody’s business: Re-engaging young Queenslanders in education. http://advancingeducation.qld.gov.au/SiteCollectionDocuments/everybodys-business-web-upload.pdf. Fredricks, J. A., McColskey, W., Meli, J., Mordica, J., Montrosse, B., & Mooney, K. (2011). Measuring student engagement in upper elementary through high school: A description of 21 instruments (Issues & Answers Report, REL 2011–No. 098). Washington, DC: Department of Education, Institute of Education Sciences, National Center for Education Evaluation and Regional Assistance, Regional Educational Laboratory Southeast. http://ies.ed.gov/ncee/edlabs. Noble, T., Wyatt, T., McGrath, H., Roffey, S., & Rowling, L. (2008). Scoping study into approaches to student wellbeing: Final report. Brisbane, QLD: Australian Catholic University and Erebus International. https://docs.education.gov.au/documents/scoping-study-approaches-student-wellbeing-final-report. United Nations. (2015). Transforming our world: The 2030 agenda for sustainable development. http://www.un.org/ga/search/view_doc.asp?symbol=A/RES/70/1&Lang=E.